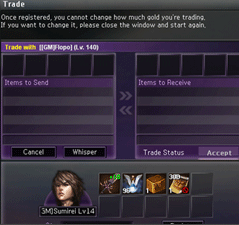 Even though you can buy and sell items at the Market, you can also directly trade money and items iwth other players through the use of a convenient trading window. Right-Click on another player and choose Trace from the menu. Trading Items: Select the item you wish to trade, enter the quantity, and then click Register Item. Trading Money: Enter the amount of money you wish to trade and click Register Gold. Transactions are completed when both players click Accept. To remove an item you have already registered to trade, just select it and click Cancel. you can trade a maximum of 5 items at a time and you can only trade items from your main character's inventory. Be sure to always check that all items and money are correct and of the correct quantity before clicking Accept to avoid scams. You can seel and buy items to and from other players with your Personal Store. After opening your Personal Store, you can still continue to move, battle, or perform other transactions. You can also search for items that other players are currently selling and buying through the Personal Store Window. Personal Stores remain open until manually closed or all stocks is sold. If you log out or die in battle then your store is also automatically closed. 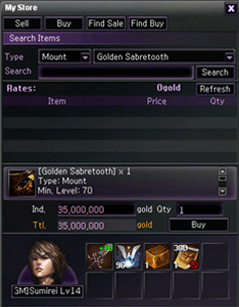 Only items in your main character's inventory can be sold in your Personal Store. From the Personal Store Window, select the Sell tab at the top. Select the item(s) you wish to sell and enter the quantity you wish to sell, and the price you want to sell them for. Sell: Sell items in your Personal Store. Rates: Check the market price of a selected item that is registered for sale. Remove: Remove the item from your Personal Store. Rates: Check the market price of an item selected in your inventory. Register: Register selected item for sale. Open Store: Open your Personal Store. Close Store: Close your currently opened Personal Store. To purchase items using your Personal Store select the Buy button from the Personal Store Window at the top. Select from Item Type to find the item you wish to buy the set a price and the amount you wish to purchase and then select Register. You can register up to 5 items at a time this way. Once you've made your selection press Open Store to begin buying. This allows other players to find the items that you are selling when and sell you the item(s) that you wish to purchase, even when you are away. Buy: Buy items in your Personal Store. Rates: Check the Market Price of a selected item that is registered to buy. Remove: Remove the item from your Personal Store Buying List. Type: Select the item type to help find an item you wish to buy. Search:Search for a specific item. Rates: Check the Market Price of a selected item. Register: Register the item to buy. 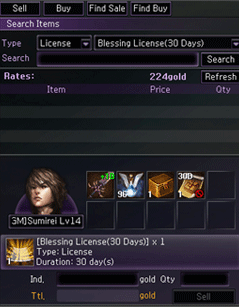 You can search for and purchase registered items for sale by other players who currently have their Personal Store open. From the Personal Store Window - Find Sale - Select the Type and Item (or search for the item) - Confirm the price they are charging and enter the desired Quantity then select Buy. Find Sale: Search for items registered by other players for sale. Search: Search for a specific item. List of items registered for sale that matches your criteria. Buy: Purchase the selected item. Search for items other players have registered to buy in their Personal Store. 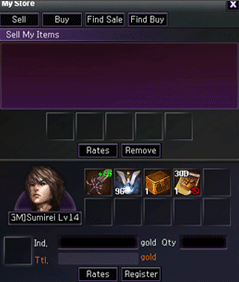 You can search for and sell items to other players that have registered to buy and have their Personal Store open. From the Personal Store Window - Find Buy - Select the Type and Item you wish to find buyers for - Confirm their Buying Price and enter the Quantity you wish to sell then select Sell. Find Buy: Search for items registered by other players that they are looking to purchase. Type: Select the item type to help find an item to check if other players are buying it. List of items players have registered to buy that matches your criteria. Shows your main character's Inventory. Sell: Sell the selected item in the selected quantity. Always check the current Market Price of an item before you sell or buy it by clicking on Rates.